Strive to be there on Shrove Tuesday! I have lost count of the number of times that either I have said, or someone has said to me, 'Easter is very early this year'! I realise the truth of that as I consider what to write for this month's magazine and find that it is all about Lent. On the first Sunday of February we will keep the Feast of the Presentation of Christ in the Temple, or Candlemas. As we remember how the infant Jesus was taken, according to custom, to the Temple to be 'presented' to God, we take one final look back towards Christmas and then turn our attention towards Lent and, ultimately, to the events of Holy Week and our celebration of Our Lord's death and resurrection. At the Presentation, the elderly Simeon recognised Jesus as the one who was the fulfilment of all the prophecies; the one who would be a light to the Gentiles; the one who was destined to be put to death but then to rise again. The world's Saviour. And so we look towards our annual preparation for the celebration of Holy Week and Easter. What are you going to do for Lent? I hope you will be able to attend one of the Eucharists which will take place in the Parish on Ash Wednesday. I also hope that you are seriously considering taking part in Springboard for Faith. Springboard for Faith is Prestbury's response to the Diocese's Springboard Initiative which is all about outreach into the community. Our response is in three 'phases'. Firstly, we prepare ourselves during Lent using material based on the Cheltenham Passion Play 2000 video. Secondly we witness to the community in two outdoor 'events' on Palm Sunday and Good Friday. Thirdly, we invite people who are not necessarily members of our congregations to join us to watch the video and explore some of the issues which it raises. A great deal of time and effort has already been given to planning for Springboard for Faith. If it is to have any success it now depends on YOU. I therefore urge you to sign up (even if you do not feel able to commit yourself to all the sessions). Encourage others to take part as well, so that together we can be prepared for phases 2 and 3. Springboard for Faith is, I believe, about drawing people to God. Drawing closer to Him ourselves and reaching out to draw to Him those who still do not fully know all that He has done for them. Commit yourself to God this Lent. Springboard for Faith takes off on Tuesday, February 12th - and if you haven't yet done so, there's still time to return your sign-up form and make sure you're part of this exciting initiative in Prestbury! By now you will have hopefully seen the posters or leaflets inviting you to join the six-week Springboard for Faith programme. If you haven't received or picked up a bright yellow form, please see the Springboard co-ordinator in your church (details below). Just as a reminder, the programme is Prestbury's response to the Springboard initiative, which aims to strengthen Christians for mission. Springboard for Faith is designed to help us talk about our faith - and, in turn, find ways to talk to others about what it means to have God in our lives. TRANSPORT IS AVAILABLE! Just tick the box on your sign-up form if you would like a lift to the Infant School, or to St Nicolas' Hall, and we will arrange transport for you. Jerry Porter, Beryl Elliott, and Daphne Philpot. will be open again in both churches after the eucharist on the two Sundays before Lent, starting on 3rd February. Perhaps a Lent Book is an established part of your Christian year, or perhaps the whole idea seems a bit rarified to you; either way, have a look at what is available, you could be pleasantly surprised. At the time of writing, our provisional book list goes like this. With Jesus in the Upper Room, by David Winter; based on Chapters 13-17 of St John's Gospel. Fruits of the Earth; from Cafod/DLT; reflections on the readings for Lent 2002 which help focus us on the path towards God's kingdom of beauty and love, truth and justice. The Unlocking, by Adrian Plass; recommended by two different people at St Mary's (hope it's still in print). Ashes to Glory, by Martin Dudley; we chose this excellent book for last year's bookstall, but it was delivered late and few people saw it. Or how about Breakfast with God? This also has day-by-day material, though not dated, so you could use it any time. Depending on how rushed you are, you can have 'continental' or 'full English'. Even if it has to be 'just coffee' you'll have a worthwhile start to the day. Learning to Dance, by Michael Mayne; personal and spiritual reflections on the arts, the sciences and the cycle of a year in retirement from the Dean Emeritus of Westminster. Messy Spirituality, by Mike Yaconelli; sub-titled 'Christianity for the rest of us'. In addition there could be some last-minute finds, and we may need to put in a substitute if any of our choices is unavailable. Take this opportunity to look at a few of the many Christian books being published now, without making a trip to Cheltenham or Gloucester. At Gloucester Cathedral, the theme for Lent 2002 is Listening, a theme explored in many different ways. Listening to the Word of God is the theme of a series of Talks for Lent, on Thursday evenings at 7.30 in the Chapter House. The first talk Listening to the Word of God through St John's Gospel by the Very Revd Stephen Smalley, is on February 14th. In subsequent weeks the focus will fall on Listening through story, through painting, poetry, music and prayer, with a wide range of speakers. Fuller details on the poster in the porch. Listen - to the St John Passion, in a performance by Gloucester Choral Society on Saturday March 9th at 7.30 pm. Listen with your eyes - to Iain McKillop's series of paintings Meditations on the Passion, on exhibition in the Cathedral from February 15th to March 30th. Gloucester Cathedral is ours, and all these activities are for our use. It is helpful to all of us from time to time to join with a different group, and refresh our awareness of the wider Christian family we all belong to. The committee met at the beginning of January. Andy Macauly attended the meeting and reported on the current position with the Youth Work. His report was very encouraging. Synergy might need to form a separate group to cater for the needs of potential younger members. Future plans for the group include a residential weekend and participation in 24/7 Prayer (24 hours of prayer, for 7 whole days) during Holy Week. Andy's work at Pittville School continues to be very well received. The committee also reviewed the Advent Bible Studies, which were particularly well supported during the day time. They also looked forward to the Lent programme of 'Springboard for Faith', discussed the themes of the Sunday sermons during Lent and also the Lent bookstall. We require some more members to participate in this committee! Please be reassured that being a committee member does not mean doing all the work! We need people to be part of the 'think-tank', which reviews and plans the programme of Education and Nurture in the Parish. If you would like to have 'a voice' and have a contribution to make, please speak to Beryl Elliott or Fr Michael. The last time this committee met, it reviewed the considerable number of 'social' events which had taken place during 2001. It also discussed the arrangements for the social side of the 'Springboard for Faith' evenings during Lent and then went on to begin to plan a calendar of events for 2002. The first of these will be a Candlemas Quiz Night on Saturday 2nd February. On behalf of the Parish I should like to welcome Mrs Nicola Bennett as the new head teacher of St Mary's Junior School. Mrs Bennett was previously head teacher of Northleach CE Primary School. She took up her appointment with us on 1st January and says she already feels very much at home in the school. We are delighted that she is with us, and offer her a warm welcome. On the afternoon of December 6th 10 pupils and their teacher from Berkhampstead School came to Abbeyfield House to sing Christmas carols to us, the audience of 7 residents with members of the house committee and friends, all of whom were comfortably seated in our large sitting room. The selection of carols was wonderful; we were privileged to hear several carols which are not normally sung and this fact made the occasion thoroughly enjoyable, so much so that the residents spoke about the selection and the singing at our supper table. We were quite gripped by the singing. As this was a new experience for us we hope Berkhampstead School will have us on their calendar for next year. Christmas Procession with Carols on Christmas Eve in the Cathedral church of Norwich was a memorable occasion. Seating was provided in every place possible from the High Altar Sanctuary, Choir, Crossing, Nave Sanctuary and Nave to the Western Crib. Most seats were taken an hour before the 3.30 start. It was refreshing to see this magnificent building coping gladly with so huge a congregation wishing to participate in the celebration at this appropriate time. The first reading, as was meant, created a dramatic contrast to the anticipating hubbub before the start. A voice from the organ screen proclaimed, 'Silence, all mankind, in the presence of the Lord' (Zechariah). Subsequent readings were from the Nave Pulpit, Lectern in the Crossing, Centre of the Nave and the Western Crib. The two Cathedral Choirs in the procession sang in the vicinity of these situations which ensured that every person felt intimately involved. To me, the highlight in the music was the solo voice in Lully, Lulla (Kenneth Leighton): it seemed to haunt the whole cathedral. Surely it must have been the Choir Girl of the Year. The National Federation of Women's Institutes issued a pamphlet, Pathway to the 21st Century, inviting all Women's Institutes throughout Great Britain to celebrate the millennium by identifying and carrying out a project to enhance their local environment. The Prestbury WI mulled this over on several occasions without coming to any decision on how they could become involved. Many members already contribute their time and talents within the community and had undertaken several projects in the past. 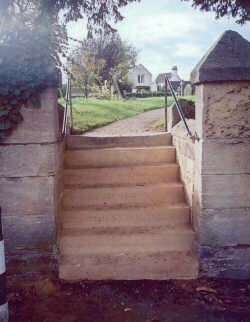 Then in March 2000 they conceived the project of restoring the seven stone steps down into Mill Street from the Churchyard of the Parish Church of St Mary's. 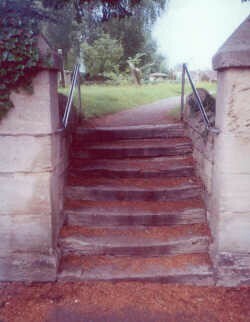 The steps form part of a public footpath through the churchyard connecting Mill Street to Prestbury High Street as well as leading to the front porch of the church. It is therefore quite an important access route for the village. Quotations for the work were invited; that from Robin Paul, Stonemason, was accepted. A proposal to the Parochial Church Council was enthusiastically received, and they agreed to share the cost. As the churchyard is in a Conservation Area, Gloucester Diocese, Cheltenham Borough Council and English Heritage all had to be consulted and a Faculty and Planning Permission had to be obtained. A form of words and a style of lettering to be inscribed on the risers had to be agreed - English Heritage objected to the new WI logo and insisted the words "Women's Institute" be written out in full. The work started on 16th July 2001 with the removal of the sidewalls and the old steps, which were set aside to ascertain whether any could be recycled. New stone was purchased, the final wording and style of lettering was approved and engraved. 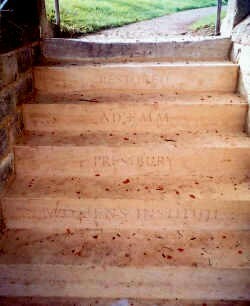 At length the steps were re-laid, the side walls rebuilt and the work completed on the 3rd November. During this whole period from March 2000 onwards Prestbury WI was busy fund raising: coffee mornings and lunches, proceeds from Christmas entertainment, local history lectures, a donation from St Mary's Sunday Bake Stall; quizzes, raffles, sponsored 'swims and slims'; the sale of music tapes, books, and vegetable produce from the WI stall, and many personal donations. The WI had been instrumental in the promotional sale of a Millennium booklet produced by Prestbury Parish Council for which they gave a donation; this was then given to the project. One activity which proved most lucrative and popular was the filling of Smartie tubes with coins which fitted, ie 1p 5p 20p £1. Each member was given a full tube of Smarties which they returned filled with coins. A final sum of £1314.64 was handed to the PCC who paid the full account of £2290.08. The balance came from the Churchyard Fund. The Millennium Steps were dedicated and blessed on 14th January in a simple and reverent service led by Fr Stephen and Fr Michael. Many members of Prestbury WI and St Mary's church were present, and the Rev Joan Winterbottom (URC) also attended. A reporter from the Gloucestershire Echo took several photographs of the occasion. Tea and biscuits were served in the church after the ceremony. The refurbishment of the steps into St Mary's Churchyard has been completed. It seemed a very long time to replace some rather dangerous stone steps but perhaps this was a procedure well worth suffering to maintain the environment of our lovely village. It has been extremely well executed; the steps look good and are a joy to walk on. Prestbury Women's Institute and St Mary's Church hope and trust these steps will give service to the people of Prestbury for many decades to come. A worthy witness to AD + MM. Venue: St Andrew's nice new building, Churchdown. Insomnia was an all-night sponsored event to raise awareness for homelessness in our diocese and to highlight the Christian church in India. I was initially struck by the enthusiasm that the young people in Prestbury had towards this event. They went out with a fervour collecting sponsorships and advertising what they were going to undertake. We also attended a couple of planning meetings beforehand and young people gave up their time to accompany Andy Macauly and me and to contribute constructively to these meetings. A great advert for our churches and for young people in general! As for the event, it was a good turnout with many youth groups from across the diocese represented and a healthy contingent from Prestbury! There were, during the night, many activities for the young people to take part in, which included a band, DJ's, a time of worship and drama. There were also workshops on homelessness, third world issues, stress management, bullying and family struggles. During the early hours of the morning we had a juggling workshop run by our own Mr Macauly and a banner painting workshop run by Claire Radburn and Kirsty Walters. Claire put a lot of hard work and effort into producing two fantastic banners, one of a map of India and one of the Insomnia logo, which young people were then encouraged to paint with images that they had thought of during the evening. At the end of the event we were told that Bishop John would be taking these banners with him when he visits churches in India shortly. One of the most interesting things during the night was that the young people were encouraged to build a shelter out of cardboard boxes outside the church. To demonstrate our focus on homelessness, Bishop John and a local MP slept outside in these shelters overnight. Although this may seem like a publicity stunt, especially if you have seen the photos in the local papers, actually it was very cold and this was proved to be the case when we had trouble de-icing our cars to go home in the morning! I think it was really encouraging to see Bishop John getting directly involved in a cause that I know he feels strongly about. From a personal point of view, as a leader, I got a chance to interact with the young people and to spend some quality time (albeit tired time!) with other youth leaders and especially my fellow youth workers, Liz, Emma and Andy M. I felt that the event was very worthwhile and gave a fantastic positive image of young people wanting to get involved in their own community and in communities in other parts of the world. I especially want to say thanks to our young people in Prestbury who did us proud: Rob, Sam, Dave, Claire, Clare, Simon, Andrew, Alex and Kirsty. December 16th saw Twilight Zone put on their much planned Christmas party. Once we had got over the shock of seeing everyone in evening dress (strictly no jeans or trainers said the publicity) we got into enjoying a fantastic event. It featured the DJ-ing talents of DJ Nuclear and band Atlantica, both from the youth club. There was also copious amounts of food - cheers to Liz and Kathy in particular! The highlight for me was that the event was the idea of young people and it was young people who made it happen - even turning up early to decorate the hall. (Thanks to Becky and Sam and their team.) There was an outward looking focus as the Brownies were able to use DJ Nuclear's talents for a party beforehand. An entirely suit-able Christmas event! I have now received the application forms for our pilgrimage to Walsingham in May - we have places reserved for 20 people. The cost of accommodation and all meals (ie full board) from after supper on the Friday until after breakfast on the Monday is £86.85 (children - under 17: £52.11; under 5: free). Please contact me for an application form which also gives details of accommodation available, meal times etc. I have to submit a list of pilgrims and their accommodation requirements, together with a non-returnable deposit of £10 per person, no later than Friday 22nd March. Transport arrangements will be sorted out in due course. On Saturday 18th May there will be a Plant Sale at St Nicolas' in aid of the Renewal Appeal. Once again we shall be most grateful if all gardeners can help us: perhaps by taking some extra cuttings, growing some bedding plants, a few vegetable plants or herbs, and potting up herbaceous perennials. Last year's sale proved that bedding plants, geraniums and fuchsias sell like hot cakes. I shall be glad to answer any queries. Happy gardening! Spend a few moments in the weeks leading up to Easter answering the questions on the Confectioners' Quiz. Win a 'sweet delight'. Quiz sheets are available in the churches or from Jessie Strawson or Marion Godden £1 a sheet. Closing date Sunday 17th March. Proceeds to St Nicolas' Renewal Appeal. We could do with a few more names to add to our list of those who lead Intercessions at St Mary's on a Sunday morning at 11 o'clock. If you think you could help, please contact me. We desperately need one or two more people to adopt a patch of grass in St Mary's churchyard. We have all the equipment (mowers, strimmers etc) but we would like you to commit about an hour once a week (in the summer; once a fortnight in the spring/autumn) to come and mow. If you can help please ring Ken Bradbury or Bob Lyle. You've just got one chance to join us for a Bible study this month because we'll not be meeting while the Springboard for Faith series is taking place. You can choose between meeting on Wednesday 6th February or Thursday 7th February, both at 8pm, to work through Acts chapter 16 together. More details from Kathy or Andy Beacham. Watch out in future editions of this magazine or the weekly pew sheet in church for details of dates and venues for April. This gives the grand total of £450. Thank you everybody! Well done! Many thanks to all who support this venture. The half-yearly profit (June-December 2001) resulted in £100 being donated to 'Cheltenham Open Door at Christmas'. If anybody is interested in joining this rota please contact me. Each Thursday we have a half-hour service in St Mary's at 10.30am followed by coffee and biscuits. We all pay for our coffee and this last year, 2001, we have raised £500 for St Mary's Heating Fund. What a wonderful achievement and I would like to thank everyone for their support. Do come and join us in 2002, we may even raise £600 this year! Thanks to all who took part in the carol singing for Christian Aid before Christmas. The area total raised was something over £1600. The amount raised by St Mary's was £127.29 and by St Nicolas' £133.45. The 2000-2001 annual collection amounted to £415. Thank you very much all current box holders. If anybody is interested in becoming a box holder, please don't hesitate to contact me. Thanks to everyone who supported Rockfish and others at our concert in December at Charlton Kings. We raised over £2000 for TEAR Fund's work in Afghanistan. The recipe that was used for the Wedding Cake I made for the Celebration of Marriage last May has at last(!) been typed and is available from me. I am asking for a donation of 50p to cover photocopying and help the St Nicolas' Renewal Appeal fund. Also typed up is the recipe for Lemon Meringue Roulade which I took along to the Sidespersons' shared buffet in the summer. Sorry it has taken so long but there have been a few distractions this year.